Having sold out months in advance, Brixton Academy is filled to the rafters with 5000 eagerly excited fans, ready to celebrate Halestorm’s latest triumph. Following the release of their epic new album, ‘Vicious’, earlier this year, the American rock heavyweights return to London to deliver their biggest show yet. Having conquered everything from the main stage at Download to becoming Grammy winners, the band are ready to shower London with yet another spectacle. Supported by wacky Swedish metal band Avatar, the night gets off to a unique start. Like watching Marilyn Manson take the lead role in The Greatest Showman, Avatar orchestrates a bizarre mix of theatrics, synchronised head-banging, monstrous shredding and all encompassing heavy metal tunes. 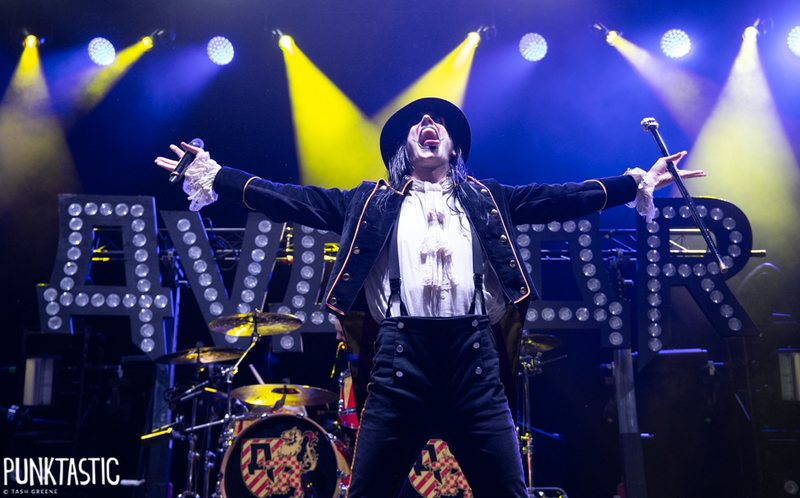 When frontman and ringleader Johannes Eckerström isn’t chugging from a oil can or going full monologue in between songs, he delivers a dynamic range of vocals whilst pleasing the crowd, including performances of ‘Smells Like A Freakshow’ and ‘A Statue of the King’. It takes a little while for the audience to get on board or even to understand what Avatar and their gimmick is all about– but once they see the band for their light-hearted nature, it’s plain sailing for them. They could not be a more creative and entertaining choice of support to kick the night off. Not long later, Halestorm arrive on stage to a thunderous reaction as they rip into the title track of their new album, before charging into ‘Love Bites (But So Do I)’ without hesitation and at a deafening volume even Motörhead could appreciate. For many American bands in a position similar to Halestorm, it is becoming increasingly difficult to make such cliché rock sound sincere and authentic. Even with some cheese in the lyrics like the sultry ‘Do Not Disturb’, the intensity and aggression that comes with it results in mass sing-alongs and complete appreciation from the crowd. At most metal shows it is expected at some point to find yourself surrounded by never-ending mosh pits, or uninterested tagalongs glued to their iPhones. Tonight however, these come seldomly as singer Lzzy Hale’s vocal gymnastics captivate the audience. 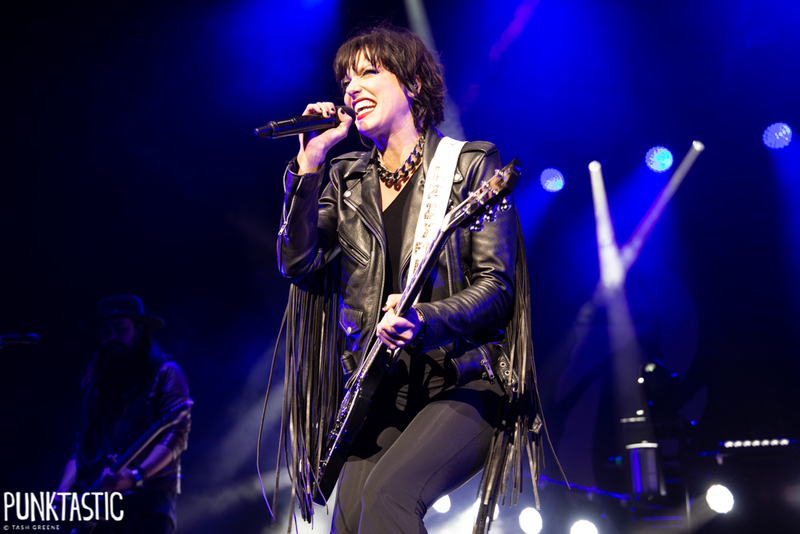 Her passionate voice offers full Pat Benatar vibes and when her and guitarist Joe Hottinger do a stripped back version of The Silence, she keeps the entire venue engrossed, holding on to every word sung with conviction. Lzzy is endearing and seems genuinely humbled by the deafening response from the crowd at the end of each song. As far as the lengths that she can go vocally, the frontwoman is truly unrivalled. Tonight, the rock veterans prove that they can offer a performance quality to match their ever growing status– it’s unstoppable: whether it’s drummer Arejay Hale proving that drum solos can be fun and not a moment worth going for a beer break, reminding their long time fans that they haven’t forgotten about old favourites such as ‘Takes My Life’, or not shying away from the hits as they end on huge renditions of ‘I Miss The Misery’ and ‘Here’s to Us’, they put on one hell of a rock show. If Halestorm have shown anything throughout the biggest show of their UK touring career, it’s that they know how to put on a extravaganza whilst staying true to themselves and that vocally, Lzzy Hale is truly on her own level in the game. The only way is up *cough* Wembley *cough*.